Wondering where that crazy title and the photo came from? 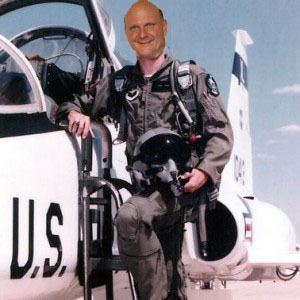 First, check out Steve Ballmer’s early pre-Microsoft career. He was the Product Manager for Proctor & Gamble’s Moist N’ Easy Snack Cakes. No harm in that, in fact he apparently sat near Jeffrey Immelt, who would eventually rise to become one of GE’s celebrated CEO’s. Okay, what about the fighter pilot thing? That would be a reference to fighter pilot John Boyd (he looks sorta like Jimmy Wales dad if the right photo comes up on the Wikipedia ad), whose “OODA” strategy is what Microsoft is missing most these days. I’ve written about Boyd a few times before, and this is perhaps my best article to date about Boyd and his “OODA” strategy. My thoughts are motivated by a recent post from Microsoft GM of Windows Phones Charlie Kindel. Kindel can’t understand why the Windows Phone hasn’t been more successful, because he feels it is superior to the alternatives, and particularly to Google’s Android. He argues in his post that the Windows Phone isn’t more successful simply because Google has less friction in its dealings with the Carriers. He says that App Developers are mostly irrelevant. That statement alone leaves me in little doubt about how App Developers should feel about the platform, and it isn’t good. That’s not all, he further goes on to say that End Users just do what they’re told by advertising and retail sales professionals. Oh my, Charlie, are you sure you want to be on the record for that too? Despite all that, he never really does say why the Windows Phone is a superior product, he just asserts that it’s true. With GM’s like this, its no wonder Microsoft has a problem with their phone. But the problem actually starts pretty far from one GM and his views, however misguided some like me may think they are. MG Siegler’s Paris Lemon blog has it right in three words, “Way Too Late”, and this is the problem Microsoft has in general. Scoble adds further clarity by pointing out that when people buy things, they want to make sure that what they’re buying doesn’t make them look stupid. In this context, what that means is if they’re going to choose to deviate from the well traveled paths–buy an Android if you want Open/Cheaper or buy an iPhone if you want Best Product–there had better be a really obvious reason to choose to be different. One they can point out to their friends and get some kudos back for. It has to be a defensible decision. Because people hate when their buying decisions make them look like idiots, especially for an obvious visible status symbol and piece of Tech Jewelry like a cellphone. Markets move by punctuated equilibrium (call it a paradigm change if you prefer, but I like the evolution metaphor) followed by periods of slower innovation and consolidation. The punctuated equilibrium happens when some massive innovation hits that makes the new product look like a whole new category, and not just an incremental improvement over some other. Apple and Steve Jobs have made a huge business and a career out of punctuating our equilibriums. Not long after punctuated equilibrium, the commoditizers show up. Their job is to give you 80% of what the innovator did at a much lower price. Let’s not confuse the commoditizers with fast followers. The latter are more about perfecting an idea that got launched a little before the innovation was done and understood. Facebook did an awesome job fast following MySpace. What does all this have to do with OODA? – Observe what the competition is doing. – Orient that observation to the market: what does it mean? – Decide how you want to react to it. – Act on that Decision. An “OODA Loop” is a complete cycle of gathering the information, deciding what it means, and acting on it. It is your decision making cycle for change. Companies alternate between that decision making and the execution needed to deliver the result. Now here is the important trick: if your company’s OODA decision loop time is faster than the competitor’s, you will force your competitor to constantly react to your moves and they will fall further and further behind. Ideally you obsolete their work after they’ve spent as much as possible of the cost and not yet gotten much benefit for it. Once upon a time, long ago, Microsoft was in a decent position, OODA-wise. They would see something some competitor was doing, and copy that innovation quickly enough, and with the force of plenty of capital and moementum from their various monopoly businesses, that they had already absorbed the competitive advantage and taken it for their own before the competitor could complete another OODA-loop and develop a new competitive advantage. For example, they sucked the juice right out of Apple’s Macintosh GUI quantum leap with Windows, and did it fast enough to blunt the Mac’s advance for years. But, somewhere along the way, things changed and Microsoft didn’t. The Tech World’s notion of a good OODA Loop got a lot shorter. Agile techniques were introduced. Lighter weight and more potent tools replaced the old monolithic C++ style tools. Apps moved first onto the web and then into the Cloud. Pretty soon we reached a world where major OODA innovation cycles started taking 1 year, then 6 months, then quarterly, and now monthly in some cases. Meanwhile, Microsoft never retooled. Their OODA innovation cycles never seem to get it done in a year, let alone a month. It takes them a good 3 years to show up to battle, at which point the dog fighters have moved a long ways from the point where Microsoft had aimed. The puck had come and gone, and they never were skating to where it would be. This is not the end of the world if a company is an amazing innovator. Apple doesn’t create the next amazing iOS device in a month either. But when your business model is to copy and commoditize the innovations of others, it’s tough to be 3 years late to the party, especially for hardware. With that much lead time you’re no longer delivering a fresh idea at a great price and the incumbent also has the advantage for hardware of having built up a potent supply chain so their own cost basis is lower. Fundamentally, Microsoft has to learn how to be far more Agile because it lives in an Agile world. There have been glimmerings back in the Gates days, for example galvanizing the company during the browser wars, but it has been a long time since the Redmondians have been able to turn the ship so swiftly. If those days are truly behind it, it’s going to be a struggle just to hold onto what they already have in hand, let alone grow. They must either get much more Agile or much better at Kinect-style innovation (i.e. equivalent innovation much more frequently). 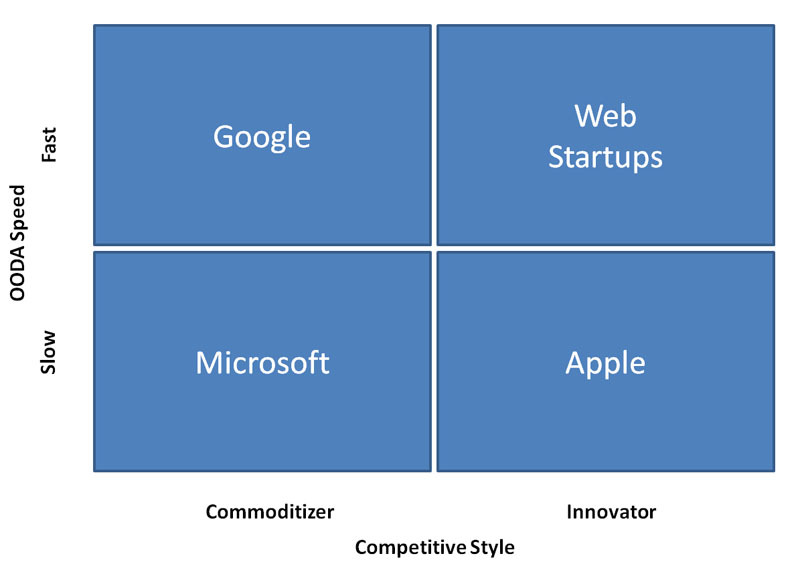 Google and Microsoft are largely commoditizers. They bring other people’s innovations to the market more cheaply, sometimes by copying, sometimes by acquisition. They probably don’t like to look at it that way, but it is largely what they’re doing. The exception is Google’s search business, which they can argue they innovate in, and of course there will be exceptions for MSFT too. But the important insight is that Google seems to be more Agile, perhaps because of their web upbringing. They can turn that crank faster and get inside the OODA loop of others. The Innovators are dropping the dinosaur killers into the pond. If they are secretive and hide their innovation until it is ready, as Apple does, and if the innovation is truly a revolutionary dinosaur killer and not just a little bit of evolution, they can afford to be pretty slow delivering these innovations. But, both Commoditizers and Innovators are subject to the OODA loop. If the market’s reaction to what the players are doing, and the market is driven by the player’s actions, is faster than your OODA decision cycle, you lose. Right now, Microsoft is flanked by Apple and Google whichever way it tries to go. The Golden Era of Tech Blogging is Over? Hogwash! If you wait long enough, some topic will come along to reignite your muse and you’ll find you just have to write a blog post. 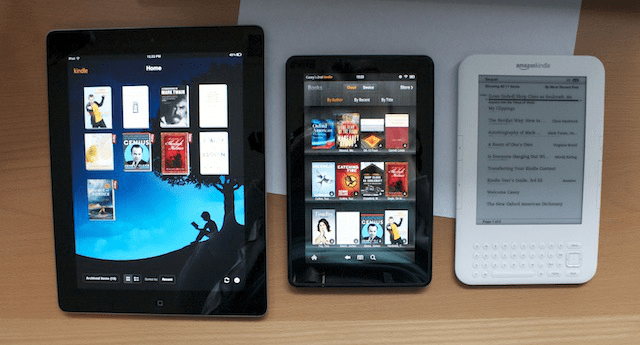 It’s been a little while since I wrote about my Kindle Fire ups and downs. I’m still very happy with the little Fire, and was recently surprised to discover that overall, video quality on the Fire seems better than it is on my iPad with Netflix. This seems to be an artifact of how much compression gets used by Netflix, since I can see the video I’m watching go in and out of fine detail focus. But that is not why we are here! 1. Corporate Acquisitions Stymie Innovation. The argument is that a big corps acquire feisty Tech Blogs, they squeeze the life out of them, killing innovation. Dude, have you been through a “liquidity event”? They all squeeze the life out of the acquiree. I can’t remember a single acquisition I have gone through where the tech survives today, although most of them the tech would be useful today. Most of the time acquisitions fail to generate net positive shareholder value. Rarely is the talent kept aboard, and rarer still does the talent continue to appear as, um, talented. Does that mean any acquisition is a sure sign the game is up in whatever space? Nope. It means the talent gets to go do it again, quite possibly in an adjacent space since they know how the rules work there. Are all these bloggers jumping out of these tech blog acquisitions abandoning blogging to join enterprise software or some such? Nope. 3. The audience needs have changed, they want: faster, smaller, and social. No kidding? And we know this, how? People deal with the competition for their attention in a lot of ways. Some decide the best idea is to switch to media where an “information quantum” is a lot smaller, Twitter being the extreme. Some, perhaps best personified by great bloggers like Seth Godin, deal with it by upping the quality of the feeds they will spend time on. What’s really clear is that a lot of the Social side are trying to design their products to lock up attention space just the way the old retailers liked to lock up shelf space. But my attention is not a shelf, and I am not getting enough of value to participate in that game. Hence, while we know that Google+, for example is growing, we have no idea what the real engagement there is doing. In cases where we can see engagement, like Twitter, it ain’t great. I wonder whether Owyang will recommend to his corporate clientelle that they drop blogging and focus on all this social. It would be interesting if he did, but I think it would be a mistake both for Owyang and the Corporations to follow that advice. Looking at the issue of how to deal with all the noise, I want to reiterate there are two types of folks. Some thrive on the choas. The more they can get, the better. Scoble is one such, and I am not surprised at his quote that “…when I write something on Twitter,Facebook, Quora, or Google+ I get immediate feedback. I get thousands of views very quickly and get distribution through things like Google’s Currents or Flipboard readers. Blogging seems to have struggled in some of these areas.” Scoble is just chasing eyeballs and traffic. But is that what you’re chasing. I met with Owyang to pitch him on a company once. He’s definitely from the Scoble ADD crowd. He barely had time to hear what we were talking about or to ask questions he was so busy with Twitter during the meeting. 4. As space matures, business models solidify – giving room for new disrupters. That’s a really odd way of relating what the body of the text goes on to say, which is that there are now enough bloggers in the world producing good enough content that the quick first mover flash in the pan can no longer scoop up vast amounts of traffic with little effort and then cash out. So what? The flash in the pan stuff shows up in every segment and unless you want to make your living chasing flashes in the pan instead of delivering real value, it isn’t cause for concern. Flash chasers are fundamentally looking for the next latent Ponzi scheme. When it gets harder to find one the focus sharpens on quality and everyone wins. That’s a far cry from deciding the era is over. Sarah Lacy has a few choice words on Owyang’s post as well, and disagrees equally as much with his conclusion. Pundits and consultants are paid to tell us something we didn’t know, and the successful ones will manage to do that. Just because it’s different doesn’t make it right or wrong. Decide for yourself. Kindle Fire: WiFi Problems Fixed, Cool Device! I wanted to follow up on my unhappy post about Kindle Fire. When I first got the device, I couldn’t do anything with it because I couldn’t connect to WiFi. As a quick aside, having had side-by-side 3G and WiFi on my iPad, I really like having the 3G and frequently turn WiFi off. I have found it is a real hassle connecting to Hot Spots compared to the ease of 3G. The good news is I was able to get my Kindle Fire to connect. I did a ton of research on the web, tried to get help from Amazon Tech Support, but basically got nowhere. Despite hearing many accounts of people with a similar problem, there were also tons of people out there having no problem at all. Ever the optimist (Engineers always are), I gambled that maybe the problem wasn’t so much my Kindle but perhaps it was my router. Now granted, every other wireless device in Da House connected to that router just fine, but it was really old, and it was really easy to bop over to Staples and pick up a new router. For the record, the router I dumped was a Belkin N1. I planned to buy another just like it, but discovered once I got to Staples that it seemed like the router world had undergone a makeover. Okay, so I bought a sleek Cisco router for $79. I plugged it in, and voila, the Kindle Fire immediately started working. I will probably try to configure that Belkin to be another access point as I can’t quite get WiFi everywhere in the house, so I will get some value beyond just getting the Kindle Fire to work. Folks who have older routers may want to consider replacing them. Many are saying the OS update to 6.1 fixed their problem, but they had to side load that with a cable. I didn’t try that because I didn’t have a mini connector USB cable on hand. The first thing my Kindle Fire did was to download that update and it all went very fast. First thing is, I would not want to trade it for my iPad, which is what a lot of people are saying. I would say that the difference between a laptop for casual things and an iPad is about the same as the difference between an iPad and a Kindle Fire. In other words, iPad is a more powerful, flexible device. But, for what it does, Kindle Fire is really cool. I also like the UX on the Kindle Fire. It makes it an extremely intuitive appliance for content consumption. It is even further from the laptop in terms of being a general-purpose computing device (I don’t hold with all these silly linkbaiters claiming PC’s are dead), but that’s fine if you want a great content consumption appliance. Some are saying the Kindle Fire has lousy or no Industrial Design, but I disagree. The physical hardware is about as cool as it can be while keeping the price down. I do wish they had splurged on the hardware switches the iPad has to lock the display orientation or to change volume, but really it isn’t that big a deal. The software UX, where it doesn’t especially cost more to do a good job looks great. There are a lot of little touches that make it nice. As Ars Technica says, “Love, love, love the lock screen photos.” Good review over there, BTW. I’ve been using the two interchangeably for web browsing, Kindle book reading, and Movie/TV watching. Having Amazon’s content available as a first class part of the Kindle Fire UX, and particularly having all the free stuff that comes with Amazon Prime is just bloody awesome. It feels like a great value and it is great fun to use. It’s biggest advantage over iPad is all the free video movies and TV episodes. Streaming that stuff is easy and it rocks. I’ve been watching old episodes of Star Trek, the X-Files, and 24, you know, the usual Geek stuff. The little 7″ screen is 1024×768, and when it is sitting on your chest 6″ in front of your nose it looks awesome. I started noticing some detail in some of these episodes I’m familiar with that I’d never noticed. Sweet! In terms of reading things, the display is crisp and readable, but I much prefer the iPad. It’s bigger, the fonts are a little bigger, and it just seems a better vehicle for me to consume email, read blogs, or read a Kindle Book. Given a choice between no tablet or a Kindle Fire, the Kindle Fire is an awesome experience for reading, its just not an iPad. The Kindle Fire form factor is interesting. It’s about the biggest thing I could comfortably hold in my hand. I could see a lot of things being very convenient that way. Last point, my wife has staked a claim on the Kindle Fire and made it clear that I need to get done “reviewing it” and pass it along to her. She’s got a 2nd gen Kindle Reader she loves, and she sees this as her upgrade. I think she’s right, BTW. She also loves the video (and watches a lot more TV than me, so ought to have it), and she has already confirmed and likes the fact that it fits conveniently in her purse, which was never a possibility for the iPad. All I can say is that when the Kindle Fire leaves me shortly, I am really going to be wishing my iPad had better video support!